As the development of technology, we can take videos easily with our smartphones, but usually there are two problems with these videos. The first one is that these videos may have some unwanted parts, like blank or redundant contents, for this problem, you can use a video cutter, like the article I wrote before: 5 Best Free Video Cutter for PC. The other one is that you may feel inconvenient to watch several videos one by one, definitely a waste of time. How to join videos together to a whole one? Here I pick up 5 best free video joiners for you to merge videos. 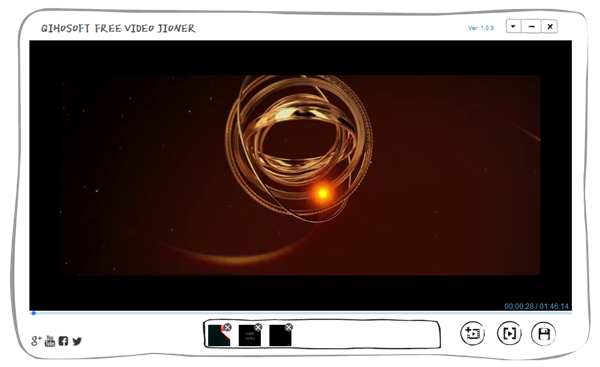 Gihosoft Free Video Joiner is a completely free tool to join several videos together. This free movie joiner is powerful yet easy-to-use that anyone can utilize its features without any technical experience. You just need to click ADD button to import video files, then rearrange the order of these videos by dragging and dropping, or delete the videos you don’t like. And you can preview the joined video to see if it meets your demands. After that you can choose output format and saving location, then join these videos into a bigger one without any quality loss. Support joining and saving videos of various formats. The joining process is a little slow. Kate’s Video Joiner is also a great video joiner software, which you can use to merge two or more videos into a single big one. Like Gihosoft Free Video Cutter, Kate’s Video Joiner also has intuitive interface and simple operations. You can tap ADD to import videos, click Up and Down to adjust the order of videos, press Clear to eliminate all the operations. It supports exporting video of various formats, like MP4, AVI, MPEG, WMV & DVD etc. Besides, you can set video and audio compressor, audio channel and audio rate, or even resize the video. Furthermore, you can preview the videos before joining in case of mistakes. Support all kinds of video formats and allow users to resize video. Come with the feature of previewing before joining. You need to register with your email before you can use this software. Free AVI MPEG WMV MP4 FLV Video Joiner is a powerful video joiner freeware. When you add the videos you want to join, click Next, then it comes to a new interface. In this interface, you can select your output directory and convert videos to different formats. The most impressive feature of this freeware is that you can not only convert your video files into other formats and audios, but also can convert them to formats appropriate for different devices. For example, if you are a iPhone user, you can convert the videos to iPhone High Quality, iPhone Standard Quality, iPhone Economy Quality. Support exporting video files to any video formats, audios, or even quality appropriate for different devices. Each format has various kinds of quality for you to select. You need to be careful when installing this software in case of installing some bundled products. Alon Video Joiner is a quite simple and brief video joiner free. You can see that from its interface, and it does a good job when joining videos. The usage is quite easy like other similar video joiners. You just need a few steps to get your videos finished. You can feel free to adjust the height and width of the final video, and you can also choose different quality for each format. However, the output format only supports AVI, MPEG, WMV and MOV, not as much as other similar software. Brief interface and intuitive operations. Set height and width of the output video as your wish. Saving is a little slow. Free Video Cutter Joiner is not only a good video cutter, but also good at combining videos. It provides two ways for you to join videos, Direct Join and Indirect Join. Direct Join is no-re-edcoding mode, which is very fast, but only supports same-type file joining; while Indirect Join supports any format, but very slow, because it has to re-encode. When you choose Re-edcoding mode, this software offers you multiple video formats to select, you can choose your favorite format freely. Provides two ways to join videos. Having multiple video formats, quality, frame rate and audio quality to select. Don’t have the feature of moving up or moving down.